Our sweater design is great for small to medium sized dogs with back length from 8" through 20". Simple but classic, this cute and affordable cable knit sweater is designed for all kinds of breeds that need extra protection during chilly nights or freezing mornings. This sweater is made with the classic cable knitting technique that adds texture and warmth to ensure the softness and coziness. 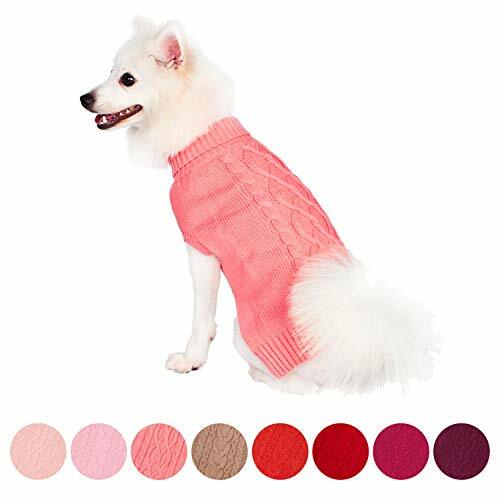 This sweater comes in 3 classic colors: royal blue, tomato red and rosy pink, which will look great on any fun-loving pup. Soft and easy-care acrylic material with the trimmed turtleneck and hem is sure to offer a comfortable fit to your furry friend whenever the temperature dips. Back Length 12", Chest Girth 17"- 19", Neck 13.5"; Measure your dog from the base of the neck to the base of the tail for back length.